William Jones (September 28, 1746 – April 27, 1794) was an English philologist and student of ancient India. He is particularly known for his proposition of the existence of a relationship among Indo-European languages. Having trained and practiced law, Jones combined his love of India with his scholarship, producing significant publications on Hindu and Islamic law. Together with Charles Wilkins, he was instrumental in establishing scholarly interest in Indian culture, which laid the foundation for the field of Indology. His contributions to linguistics and inspiring Western interest in the study of India remain significant advances in our understanding of our common heritage as the family of humankind. William Jones was born on September 28, 1746, in London, England. His father (also named Sir William Jones) was a famous mathematician. The young William Jones was a linguistic prodigy, learning Greek, Latin, Persian, Arabic, and the basics of Chinese at an early age. By the end of his life he knew thirteen languages thoroughly and another twenty-eight reasonably well. Though his father died when he was only three, Jones was still able to attend Harrow School and go on to university. Too poor, even with an award, to pay the fees, he gained a job tutoring seven-year-old Earl Spencer, son of Lord Althorp, ancestor of Princess Diana. Jones graduated from the University of Oxford in 1764. By the age of 22, Jones was already a well-known orientalist. He worked as a tutor and translator for the next six years, during which he published, on the request of King Christian VII of Denmark Histoire de Nader Chah, a French translation of a work originally written in Persian. This would be the first of numerous works on Persia, Turkey, and the Middle East in general. In 1772, he was made a fellow of the Royal Society, and in 1773, a member of the famous Literary Club of Dr. Johnson. 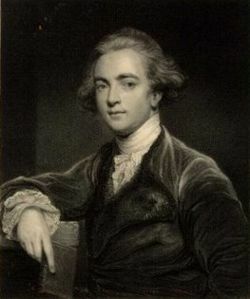 In the early 1770s, Jones studied law, which would eventually lead him to his life-work in India. He was called to the bar at the Middle Temple in 1774. After a spell as a circuit judge in Wales, and a fruitless attempt to resolve the issues of the American Revolution in concert with Benjamin Franklin in Paris, he was appointed to the Supreme Court of Bengal, India in 1783. He was knighted the same year. In India, he was entranced by its culture, an as-yet untouched field in European scholarship. In 1784, with the help of Charles Wilkins, he founded the Asiatic Society of Bengal and started the journal Asiatic Researches. This was the beginning of the renewal of the interest in India and its culture. Over the next ten years he would produce a flood of works on India, launching the modern study of the subcontinent in virtually every social science. He wrote on the local laws, music, literature, botany, and geography, and made the first English translations of several important works of Indian literature. Jones died on April 27, 1794, from an inflammation of liver. He was only forty-eight years old. Of all his discoveries, Jones is best known today for making and propagating the observation that Sanskrit bore a certain resemblance to classical Greek and Latin. In The Sanscrit Language (1786) he suggested that all three languages had a common root, and that indeed they may all be further related, in turn, to Gothic and the Celtic languages, as well as to Persian. The Sanscrit language, whatever be its antiquity, is of a wonderful structure; more perfect than the Greek, more copious than the Latin, and more exquisitely refined than either, yet bearing to both of them a stronger affinity, both in the roots of verbs and the forms of grammar, than could possibly have been produced by accident; so strong indeed, that no philologer could examine them all three, without believing them to have sprung from some common source, which, perhaps, no longer exists (Jones 1788). Jones devised the system of transliteration and managed to translate numerous works into English, among others the Laws of Manu (Manusmriti), Abhiknana Shakuntala, Ritu Samhara, and Gita Govinda. As early as the mid-seventeenth century Dutchman Marcus Zuerius van Boxhorn (1612-1653) and others had been aware that Ancient Persian belonged to the same language group as the European languages, and even though in 1787 American colonist Jonathan Edwards Jr. demonstrated that the Algonquian and Iroquoian language families were related, it was Jones' discovery that caught the imagination of later scholars and became the semi-mythical origin of modern historical comparative linguistics. He is thus regarded as the first who demonstrated that there was a connection between Latin, Greek, and Sanskrit languages. In addition, Jones was the first westerner who studied Indian classical music, and the first person who attempted to classify Indian plants and animals. After him, many western universities founded chairs in Sanskrit. Jones, William. 1770. Histoire de Nader Chah. Londres. Jones, William. 1786. The Sanscrit Language. Jones, William. 1792. Mohammedan Law of Inheritance. Calcutta: J. Cooper. Jones, William. 1792. Mohammedan Law of Succession to Property of Intestates. London: Dilly. Jones, William. 1794. Institutes of Hindu Law, or the Ordinances of Manu. Calcutta: Government Press. Jones, William, C. Wilkins, and Kālidāsa. 1795. The story of Dooshwanta and Sakoontalā: Translated from the Mahābhārata, a poem in the Sanskreet language. London: F. Wingrave. Classic Encyclopedia. Sir William Jones Encyclopedia Britannica 11th edition. Retrieved January 16, 2008. Poser, William J. and Lyle Campbell. 1992. Indo-European practice and historical methodology Proceedings of the Eighteenth Annual Meeting of the Berkeley Linguistics Society (pp. 214-236). Retrieved January 16, 2008. Biography of Sir William Jones – Jones’s biography by Dr. K. L. Kamat. History of "William Jones (philologist)"
This page was last modified on 21 May 2014, at 15:15.